The stewardship of our finances is a tremendous—and often overlooked—area of our lives as disciples of Jesus Christ. We serve a generous God who want us to form His life-giving generosity in us. When we give, we do so not out of duty, but rather in glad response to what God has done for us and with excitement around getting to play a part in His grace reaching more of our city. 2 Corinthians 8-9 describes this kind of gospel-giving as joyful, sacrificial, and regular. When i Give, where does the money Go? When you give to Living Water, you are helping make known the beauty of Jesus in Vancouver and beyond. Every dollar given goes directly to our mission through the preaching of God’s word, training of believers, outreach to our city, and resourcing of gospel-centered ministries here in Vancouver and all over the world. Staffing, facilities, operating expenses (like children’s curriculum/supplies, printed materials, media hosting, etc. ), and our missionaries/church planters overseas are all funded by your giving. Place your gifts in an offering box during the Sunday morning gathering. 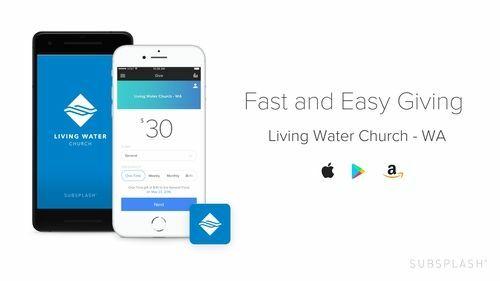 Set up a recurring payment or one time gift on our church app. Mail your giving to the church office: Finance Team, 2901 NE 65th Ave, Vancouver, WA 98661. Making known the beauty of Jesus in all of life.